A landslide in Nepal on 2 August killed more than 150 and search and rescue has ended. Experts say this event, one of the deadliest in the country’s recent history, is a wake-up call for hazard mapping, early warning, and disaster management. “The scale of human casualties in terms of fatal incidents is enormous and this is appalling,” Nepal Red Cross Society’s (NRCS) disaster risk reduction coordinator Krishna KC told IRIN. During the early morning of 2 August, a 1.9km long slope of land perched 1,350 metres above the Sun Koshi river collapsed, according to an evaluation report by the Kathmandu-based International Centre for Integrated Mountain Development (ICIMOD). Seven hundred and fifty personnel from the Nepal Army and Armed Police Force (a paramilitary unit) are continuing search and rescue efforts in the area, around 200km northeast Kathmandu. “We are shocked with the number of deaths and there are still hundreds of people missing and our teams are desperately searching for them night and day,” said Laxmi Dhakal, spokesman at the Ministry of Home Affairs, told IRIN on 6 August. According to NRCS, the disaster caused one of the highest death tolls due to a landslide in a single village in Nepal’s history since records began in the 1950s. In the past decade landslides killed over 1,300 people and destroyed 10,000 houses, according to NRCS. Government officials and scientists from ICIMOD and UN agencies have travelled to the affected area to support the ongoing response efforts and research how prevention and preparedness can be improved in what the Asia Disaster Preparedness Center calls one of the most disaster-prone countries in the world. Experts remain concerned about potential flood risk downstream. 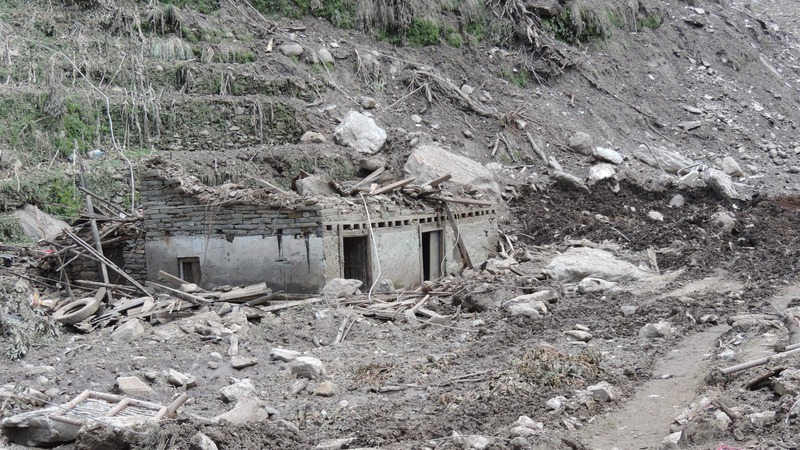 According to the government’s Department of Hydrology and Meteorology (DHM), debris created a dam across the Sun Koshi river within 13 hours of the landslide starting. Seven million cubic metres of water now extend around 3km upstream, creating a large lake. The latest report by NRCS predicts that the breach of the land mass could create substantial flood risk for 11 downstream Nepali districts. The event spurred evacuations in India’s Bihar State to the south of Nepal. According to government figures, more than 50,000 people and their livestock were evacuated from their homes near the Kosi river in Bihar in anticipation of a rush of water if the landslide-induced lake in Nepal were to break or be released too quickly. Both houses and dead bodies were dug from the debris after a massive landslide struck Jure village north of Nepal's capital, Kathmandu, on 2 June, displacing hundreds and killing at least 33. In its immediate response, the Nepal Army conducted controlled explosions around the debris dam to release some of the water, and the government has recommended these be continued so as to avoid a major downstream hazard, as water continues to build up behind the blockage. “We are taking every step to protect the local communities and prevent any further humanitarian disaster,” said DHM chief Rishi Ram Sharma, explaining that this tragic event exposed the need to launch large-scale national disaster risk reduction programmes to avoid fatalities in the future. Nepal has experienced over 14 large landslides since 1967, according to government records. According to ICIMOD, the Sun Koshi Valley experienced massive floods and landslides in 1982, 1987, and 1996. The landslide in 1996 killed 54 people. According to the Nepal Risk Reduction Consortium (NRRC) - a coalition of humanitarian, development, financial, and government bodies - floods and landslides are the main cause of 300 deaths per year in Nepal and economic damage exceeding US$10 million. Experts say much more remains to be done - including hazard mapping and early warning systems - to ready people who live in vulnerable areas. “Our most crucial concern is that people continue to live around these most high risk areas and if we fail to develop a knowledge base and implement it into action, the scale of humanitarian disaster will grow more,” said Arun Bhakta Shrestha, senior climate change specialist at ICIMOD. “Time is really running out for us given the country’s geological fragility and there is very urgent need to do in-depth studies to map out the most landslide risk areas in Nepal,” he said, adding that humanitarian disasters of this scale could be averted if there was a better risk knowledge system in place. "Flood Risk Management" is one of the NRRC’s flagship programmes, led by the Ministry of Irrigation and the World Bank. NRRC coordinator Moira Reddick told IRIN: "Conducting risk analyses and developing early warning systems is extremely important for Nepal because landslides and floods cause significant loss of life and property, and can damage local and national economies. * This report was amended on 7 August with the latest figures.